Called Parkinson’s Law, as coined in 1955 by Cyril Northcote Parkinson. He was a British Naval Officer, and his point was to make satirical comments about public administration and bureaucracy. I heard it years ago in a management class when my professor was discussing time management, and I thought it was so true. How many times have you put off a task you had 2 weeks to complete until the last minute, and it only took you 20 minutes to actually do? It’s also the same principle behind what my mom used to say about it only takes a married man 15 years and 15 minutes to do something. Anyone who has cohabited with their significant other knows this is also the truth. I have proved this theory time and time again because I happen to be a master at procrastination. I mean probably the best procrastinator ever. I can’t tell you how many times I’ve waited to the last minute on a project I’ve had weeks to work on and even amaze myself at how quickly I knocked it out when I was scrambling 10 minutes before the deadline to finish. All the while berating myself because the biggest issue with procrastination is the stress it brings. Worried you won’t be able to finish in time or God forbid there is an unanticipated problem that crops up. I try not to be a procrastinator, and I do well about 80% of the time. I block schedule my calendar and allow myself enough time but not too much time to complete a task. I also try not to waste time doing busy work or meaningless work like surfing Facebook under the guise of curating content. The key to getting more done in less time is being able to accurate project how much time a task will take and your level of focus on the task at hand. Start by writing down all you need to get done if you don’t already have a running list. Preferably this list should all be in the same place not on 25 sticky notes and scraps of paper all over the place. I use Trello (a free project manager software that is awesome) and a notebook. I should just use Trello, but I can’t get past the act of writing things down physically. It makes me feel better. After you’ve written down your list of stuff to do go back through and write down all the parts to each task. Once I started doing this, it made me much more efficient. I would have a task like schedule social media for the week. Well, looking at it, you’d think that won’t take long. Except the task included figuring out what to post, making the graphics, and THEN the actual scheduling. On 5 different platforms. Once I started to break it down my life went much smoother, and I am much more efficient because I can batch task. 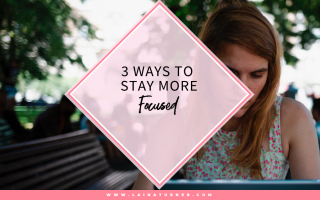 If you don’t know what batch tasking is you can read my post here, but the gist is it’s grouping similar tasks together, so you aren’t bouncing back and forth between things which will slow you down. When I write down all the components of each task, no matter how small, I can then group them into batches. It makes me more efficient and takes less time to complete. Notice I’ve said the phrase “write down” a million times. That’s because YOU MUST WRITE THINGS DOWN! Whether it’s your goals or a to-do list. You need to write it down for it to be real. Now take your list and take your calendar and give each of those tasks a realistic time slot that’s not too much time but also not too little. Schedule yourself breaks. Don’t plan out 8 hours straight of work. You might be able to do it, but you won’t be effective. You should get up and walk around at least a few minutes on every hour. If it’s scheduled in your day, you won’t feel guilty. Know when your productive time is and when your body and mind naturally needs a break. I’m great first thing in the morning but my energy tanks from about 11-2 then I’m back up and running again. I’ve learned that taking a nap or watching Netflix or cleaning the house (hahahahaha) during my off time makes me more prepared to CRUSH IT ( by Gary Vaynerchuk) when I get back to work. Sometimes you do have to push through, but if you manage your time right, you shouldn’t have to because you’ll be much more productive when you are working. Track how much time things take you so you can continue to work on being more productive and efficient as you schedule tasks in the future. Also look at what you hate doing it might be a task you will want to think about outsourcing. When you dislike a task or aren’t good at it, it’s a drain of mental energy, and you usually will try to put it off as long as possible. It’s better to focus your energies on what you’re good at. Take time to celebrate. You might think this sounds nuts. To celebrate a task. But you work hard. Be proud of what you’re accomplishing. Even if it’s the most mundane task it’s moving your business and life forward, so it IS something to be proud of. If you’re like me, you’re constantly glued to your laptop, phone, social media, under the guise of working. Sometimes you do need to say what the hell I’m not doing a thing today and shut everything off. Self-care and taking the time to recharge your batteries is the best thing you can do to boost your productivity. If you have ways, you keep yourself organized and efficient I’d love to hear them.